This article includes a list of the different types of atomic and sub-atomic particles found or hypothesized to exist in the whole of the universe, categorized by type. Properties of the various particles listed are also given, as well as the laws that the particles follow. For individual lists of the different particles, see the list below. Elementary particles are particles with no measurable internal structure; that is, it is unknown whether they are composed of other particles. They are the fundamental objects of quantum field theory. Many families and sub-families of elementary particles exist. Elementary particles are classified according to their spin. Fermions have half-integer spin while bosons have integer spin. All the particles of the Standard Model have been experimentally observed, recently including the Higgs boson. Many other hypothetical elementary particles, such as the graviton, have been proposed, but not observed experimentally. Fermions have half-integer spin; for all known elementary fermions this is ​1⁄2. All known fermions, except neutrinos, are also Dirac fermions; that is, each known fermion has its own distinct antiparticle. It is not known whether the neutrino is a Dirac fermion or a Majorana fermion. Fermions are the basic building blocks of all matter. They are classified according to whether they interact via the strong interaction or not. In the Standard Model, there are 12 types of elementary fermions: six quarks and six leptons. Quarks are the fundamental constituents of hadrons and interact via the strong interaction. Quarks are the only known carriers of fractional charge, but because they combine in groups of three (baryons) or in pairs of one quark and one antiquark (mesons), only integer charge is observed in nature. Their respective antiparticles are the antiquarks, which are identical except that they carry the opposite electric charge (for example the up quark carries charge +​2⁄3, while the up antiquark carries charge −​2⁄3), color charge, and baryon number. There are six flavors of quarks; the three positively charged quarks are called "up-type quarks" while the three negatively charged quarks are called "down-type quarks". Leptons do not interact via the strong interaction. Their respective antiparticles are the antileptons, which are identical, except that they carry the opposite electric charge and lepton number. The antiparticle of an electron is an antielectron, which is nearly always called a "positron" for historical reasons. There are six leptons in total; the three charged leptons are called "electron-like leptons", while the neutral leptons are called "neutrinos". Neutrinos are known to oscillate, so that neutrinos of definite flavor do not have definite mass, rather they exist in a superposition of mass eigenstates. The hypothetical heavy right-handed neutrino, called a "sterile neutrino", has been left off the list. The Higgs boson is postulated by the electroweak theory primarily to explain the origin of particle masses. In a process known as the "Higgs mechanism", the Higgs boson and the other gauge bosons in the Standard Model acquire mass via spontaneous symmetry breaking of the SU(2) gauge symmetry. The Minimal Supersymmetric Standard Model (MSSM) predicts several Higgs bosons. A new particle expected to be the Higgs boson was observed at the CERN/LHC on 14 March 2013, around the energy of 126.5 GeV with an accuracy of close to five sigma (99.9999%, which is accepted as definitive). The Higgs mechanism giving mass to other particles has not been observed. Elementary bosons responsible for the four fundamental forces of nature are called force particles (gauge bosons). Strong interaction is mediated by the gluon, weak interaction is mediated by the W and Z bosons. The graviton, listed separately above, is a hypothetical particle that has been included in some extensions to the standard model to mediate the gravitational force. It is in a peculiar category between known and hypothetical particles: As an unobserved particle that is not predicted by, nor required for the Standard Model, it belongs in the table of hypothetical particles, below. But gravitational force itself is a certainty, and expressing that known force in the framework of a quantum field theory requires a boson to mediate it. neutralino neutral bosons ​1⁄2 The neutralinos are superpositions of the superpartners of neutral Standard Model bosons: neutral Higgs boson, Z boson and photon. chargino charged bosons ​1⁄2 The charginos are superpositions of the superpartners of charged Standard Model bosons: charged Higgs boson and W boson. photino photon ​1⁄2 Mixing with zino and neutral Higgsinos for neutralinos. wino, zino W± and Z0 bosons ​1⁄2 The charged wino mixing with the charged Higgsino for charginos, for the zino see line above. gluino gluon ​1⁄2 Eight gluons and eight gluinos. gravitino graviton ​3⁄2 Predicted by supergravity (SUGRA). The graviton is hypothetical, too – see next table. dual graviton 2 Has been hypothesized as dual of graviton under electric-magnetic duality in supergravity. axino ​1⁄2 Superpartner of the axion. Forms, together with the saxion and axion, a supermultiplet in supersymmetric extensions of Peccei–Quinn theory. dilatino ​1⁄2 Superpartner of the dilaton. inflaton 0 Unknown force-carrier that is presumed to have the physical cause of cosmological “inflation” – the rapid expansion from 10−35 to 10−34 seconds after the Big Bang. majorana fermion ​1⁄2 ; ​3⁄2 ?... gluino, neutralino, or other – is its own antiparticle. "Tachyon" is a generic name for hypothetical particles that travel faster than the speed of light (and so paradoxically experience time in reverse due to inversal of Theory of relativity) and have an imaginary rest mass, they would violate the laws of causality. 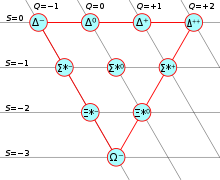 Composite fermions (especially 3 quarks), in which case they are called baryons. Composite bosons (especially 2 quarks), in which case they are called mesons. A combination of three u, d or s-quarks with a total spin of ​3⁄2 form the so-called "baryon decuplet". Other exotic baryons may also exist. Ordinary mesons are made up of a valence quark and a valence antiquark. Because mesons have spin of 0 or 1 and are not themselves elementary particles, they are "composite" bosons. Examples of mesons include the pion, kaon, and the J/ψ. In quantum hadrodynamics, mesons mediate the residual strong force between nucleons. 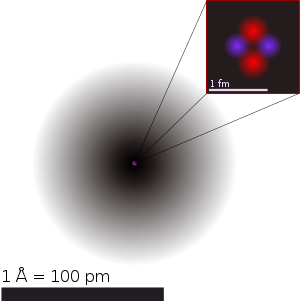 Atoms are the smallest neutral particles into which matter can be divided by chemical reactions. An atom consists of a small, heavy nucleus surrounded by a relatively large, light cloud of electrons. Each type of atom corresponds to a specific chemical element. To date, 118 elements have been discovered or created. Molecules are the smallest particles into which a non-elemental substance can be divided while maintaining the physical properties of the substance. Each type of molecule corresponds to a specific chemical compound. Molecules are a composite of two or more atoms. See list of compounds for a list of molecules. A molecule is generally combined in a fixed proportion. It is the most basic unit of matter and is homogenous. A GIMP (gravitationally interacting massive particle) is a particle which provides an alternative explanation of dark matter, instead of the aforementioned WIMP. A geon is an electromagnetic or gravitational wave which is held together in a confined region by the gravitational attraction of its own field of energy. An ion (a charged atom or molecule) is either an anion or a cation. A dislon is a localized collective excitation of a crystal dislocation around the static displacement. ^ Sylvie Braibant; Giorgio Giacomelli; Maurizio Spurio (2012). Particles and Fundamental Interactions: An Introduction to Particle Physics (1st ed.). Springer. p. 1. ISBN 978-94-007-2463-1. ^ Khachatryan, V.; et al. (CMS Collaboration) (2012). "Observation of a new boson at a mass of 125 GeV with the CMS experiment at the LHC". Physics Letters B. 716 (2012): 30–61. arXiv:1207.7235. Bibcode:2012PhLB..716...30C. doi:10.1016/j.physletb.2012.08.021. ^ Abajyan, T.; et al. (ATLAS Collaboration) (2012). "Observation of a new particle in the search for the Standard Model Higgs boson with the ATLAS detector at the LHC". Physics Letters B. 716 (2012): 1–29. arXiv:1207.7214. Bibcode:2012PhLB..716....1A. doi:10.1016/j.physletb.2012.08.020. ^ Kayser, Boris (2010). "Two Questions About Neutrinos". arXiv:1012.4469 [hep-ph]. ^ a b c d Particle Data Group (2016). "Review of Particle Physics". Chinese Physics C. 40 (10): 100001. Bibcode:2016ChPhC..40j0001P. doi:10.1088/1674-1137/40/10/100001. hdl:1983/c6dc3926-daee-4d0e-9149-5ff3a8120574. ^ Maartens, R. (2004). "Brane-World Gravity" (PDF). Living Reviews in Relativity. 7 (1): 7. arXiv:gr-qc/0312059. Bibcode:2004LRR.....7....7M. doi:10.12942/lrr-2004-7. PMC 5255527. PMID 28163642.